You can book your own private paint and sip event at Gallery 27! Have the whole place to yourself for your birthday party, bachelorette party, bridal shower, baby shower, networking party, corporate event or whatever else you can imagine! Don’t forget that we are a BYOB art studio!!! Let your imagination run wild when it comes to bringing in your own wine, beer, beverages and food! 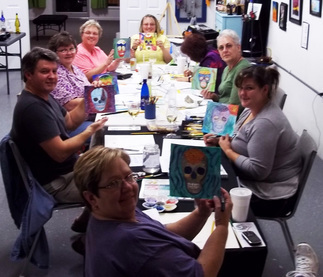 Guests may reserve a private party on Monday – Sunday with a 10 painter minimum at $25 per person for a 2-3 hour class. A supply cost of $50 is due upon booking a date for your party. The supply cost is non-refundable and will go towards the cost of the party. Additional guests may be paid for on the day of the big event. Non-painters are still considered as “paying guests” and will be charged the class fee for attending the party and using our facilities. We can accommodate a 30 guest maximum. A private party includes your choice of painted masterpiece (click the “Gallery” tab located above for painting selections), all materials (aprons,easels, canvases and ALL art supplies), all plastic plate ware, eating utensils, cups, plastic stemware and napkins. All painting setup and clean up for the painting experience are provided by Gallery 27. You are also more than welcome to bring with you any beverages and food that you would like or if you would like your party catered, we can make some fantastic suggestions! We strive to make our guests comfortable and meet their needs. If you have any special requests before the private party painting session or after, feel free to call us to chat about it! The payment for the party minimum must be paid within 6 days of receiving the invoice or we will assume that you no longer want to have the party and the date will be open to other offers. Do you love the Gallery 27 concept, but would prefer to have a paint and sip party at your home, restaurant, winery or special event? Gallery 27 will come to you! Depending on the painting that the host chooses, the painting times range from 2 to 3 hours at a rate of $40 per person with a 20 painter minimum and a $50 travel and setup/clean up fee. This includes all travel up to 30 miles from Gallery 27, set up for the class, all art supplies such as easels, brushes, paints, aprons, table coverings, canvases, 2-3 hours of professional art instruction and all clean up. Please note that our professional instructor must be allowed at least 1 hour to arrive early and set up and that there must be tables and chairs already present at the place of painting. Click here to see all of the paintings you can choose from! No risky rope swings. No boring seminars. No ridiculous games. Your newest team building exercise involves creativity, relaxation and art. Yes, art – even for those who think they can only paint by numbers (or not at all). Savvy business owners, corporate HR directors and nonprofit execs are engaging Spirited Art for hands-on team building sessions. Participants pick up a paint brush and follow easy-to-understand steps from a knowledgeable facilitator who guides the intersection of work and art. Through the team process, colleagues begin to break downs walls, build up camaraderie and share fulfillment of a job well done—all with the right mix of humor and fun. And as a lasting memento, each has their own “masterpiece” to take back to the office. An Art teambuilding session is time efficient (two to three hours) and cost effective ($25 per person with a $5 discount for groups of 15 or more). We travel to your location or you can host your event at our location in our “Art Studio”. Gallery 27 would like to give back to the Community! We are willing to schedule non-profit paint and sip fundraisers and allow our customers to participate in all the fun while giving back at the same time! There is a 20-painter minimum to be paid up front in order to secure a non-profit fundraiser date and time. All fundraisers classes are 2 and 3 hour paintings at $40-$50 per person with $10-15 going back to the fundraisers featured organization. We can accommodate the non-profit fundraisers on Mondays – Sunday. On or off site. Call 704-349-3972 to book a private party or event today!